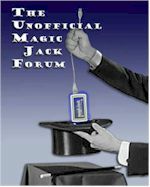 is all the sellers on ebay resellers of the magicjack? i noticed some people have like hundreds of these things. Will not be on forum until after June 15th. No things haven't changed. It is still a violation of the terms of the reseller agreement. One of the reasons I chose not to become a reseller. The terms are quite strict. The people on ebay must be connected with the company somehow or they are illegally selling. Please do not buy magicJack's from e-bay cause some devices there are already registered.